Brrr! Chilly temperatures in Connecticut means it’s time to whip up some hot cocoa and get out the mini marshmallows. 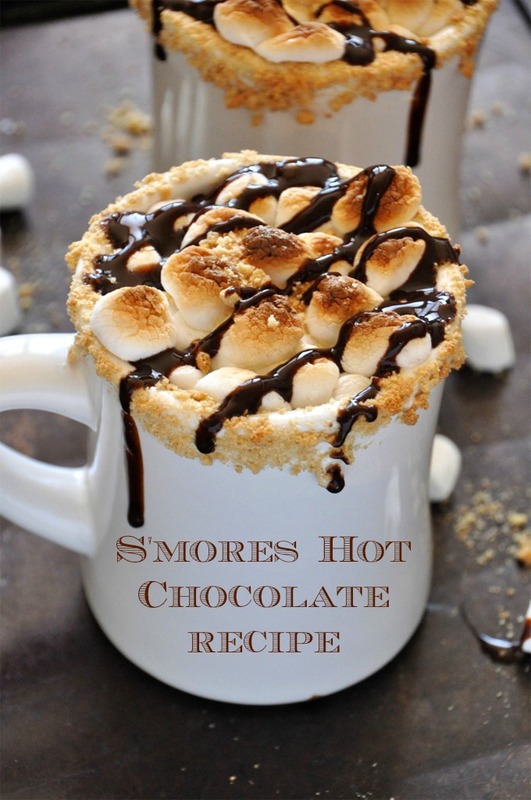 Below is a delicious recipe that completely elevates the traditional flavor and makes hot chocolate a gourmet treat! Hot chocolate is one of the many things that I look forward to during the winter months. I have great memories of sledding or ice skating with friends and then going inside to get warmed up with hot chocolate and melted marshmallows. I’m pretty sure that my Mom made it from the classic Swiss Miss mix with mini marshmallows and hot water. Fast forward to a Christmas visit to Santa Fe, New Mexico where we had authentic Mexican Hot Chocolate with real milk – and I was forever spoiled. After that, I don’t think that I can ever go back to a hot chocolate mix made with water. After having such memorable hot chocolate, my desire for more sophisticated hot chocolate combinations has taken me on a quest. Some of my new favorite variations to add to hot chocolate are salted caramel, peppermint and Nutella. So yummy. S’mores Hot Chocolate is second to none. It’s absolutely decadent and the crushed graham cracker around the rim adds an unexpected element. I modified the original recipe from the Minimalist Baker (only slightly) by using whole milk and real sugar. The result is a rich, gooey, and totally delicious treat to sip by the fire or whenever you want to warm up. Preheat oven to low broil and move oven rack to the second spot from the top (high enough up to broil your marshmallows). Heat milk in a saucepan over medium heat until warmed through – about 5 minutes. Be careful not to overheat or scald. Add cocoa powder, chocolate syrup, sugar, and salt to the milk and whisk vigorously until thoroughly combined. Next, take a few mini marshmallows and rub them on the rims of the mugs so the marshmallow sticks to the rims. The marshmallow will act like glue and make the graham crackers stick. Put the crushed graham crackers on a plate and dip the rims of the mugs in the graham cracker crumbs until the rims are well coated. If you love graham crackers, you can also add them to the bottom of your mug for extra flavor. Pour the hot chocolate into the mugs and top with about ¼ cup marshmallows each. Set mugs on a baking sheet and put it in the oven. Broil marshmallows until browned, watching carefully so they don’t burn. Carefully remove the baking sheet from the oven and top with a drizzle of chocolate syrup and extra graham cracker crumbs. Allow mugs to cool for handling or wrap the mugs in a small kitchen towel and serve them that way.